We are using NServiceBus and the awesome new suite of monitoring tools, and go-live is just around the corner. We are hosting our audit and error queues on a dedicated audit server, as recommended, along with ServiceControl and ServicePulse. 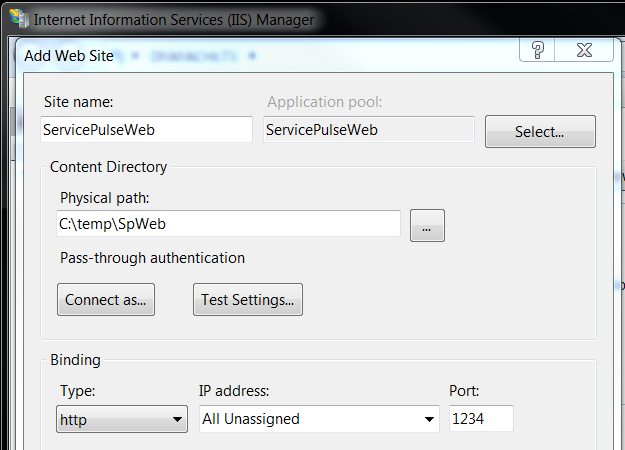 How do we configure authorization for the ServicePulse website to allow a select group of IT Ops users to access the site without opening up access to the whole company? C:\Program Files (x86)\Particular Software\ServicePulse>ServicePulse.Host.exe --extract --serviceControlUrl="http://localhost:33333/api" --outPath="C:\temp\SpWeb"
If you are setting up a new NServiceBus installation or are upgrading to the Particular Platform from an older version of NServiceBus, I hope this post helps you secure your ServicePulse dashboard.